National Security Screens carries three types of screen frames. Box Frames are the most commonly used screen frame. Box frames are easily identified by their rectangular shape when looking at a cross cut section. These screen frames are made to be removed easily through a variety of attachment methods. 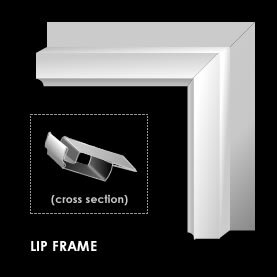 Lip frames are basically a box frame with a lip attached to it. These frames are installed by screwing the lip of the frame onto the window molding. The frames have the added benefit of preventing access to the alarm wiring by sandwiching the wiring channel between the frame and the window mold. 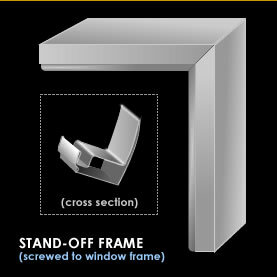 Stand-off frames are ideal for protecting windows that utilize storm window systems, the stand-off frame covers the storm window frame and is screwed to the side of the storm window frame. They also have the additional benefit of allowing for full window screen protection where there had only been a half window screen originally.